— Russell, Bertrand (1919: 60) Mysticism and Logic: And Other Essays. Longman, London. Begin by revisiting with the whole class the patterns that we found in Pascal's Triangle in the Pascal's wager unit in Faith as a Way of Knowing. All images from Math is fun website. 2, 5, 8... The number of cards needed for each of first three levels (rows) of the House of Cards. Have some packs of playing cards and copious amounts of scratch/rough paper ready in advance. Students should work in pairs to build a classic House of Cards. A small prize should be awarded to the pair with the most levels that can stand alone for at least 10 seconds! 1. Write, using the fewest possible words, a grammatical prose paragraph that provides definitive instructions to construct a classic house of cards. 2. What is the largest House of Cards that can be made with a single pack of cards? 4. Invent or discover a universal formula for total number cards needed to construct a House of Cards with n rows. There are multiple ways to approach this. Be rigorous. Diagram and present your proof succinctly and clearly. Be prepared to present your findings to the entire class. — Feynman, Richard P. (1999) The Pleasure of Finding Things Out: The Best Short Works of Richard P. Feynman. Perseus, Cambridge, MA. Students already encountered Nobel prize winning physicist, Richard Feynman in Theory of Ignorance and Imagination(with constraints) and living in the subjunctive units, both in Ways of Knowing. A student volunteer should read aloud his wry quote about his own early childhood math training. Ask students whether his definition of mathematics resonated with them as they worked through the House of Cards task. At least two volunteer groups of students to present their thinking on the House of Cards investigation. It will be interesting to see the various strategies that the collaborative pairs adopted and how they got in the time allocated. You can find expression by a flash of brilliant insight or, more likely, dogged trial and error! When you lay out the number patterns systematically, you should eventually spot that if you take any counting number: add one to it, multiply it by itself, and then divide everything by two, you will obtain the correct cumulative total (of your number and its predecessors) every time. Fortunately the special case of Mathematical Induction comes to the rescue! This is somewhat confusing because Mathematical Induction is actually a special kind of deductive reasoning with some very specific applications like arithmetic series, and is very handy for investigations like the House of Cards. 1. Show that the expression is valid for the base (smallest) case. 2. Assume that the expression is valid for any case n. Build on that assumption by showing that is valid for the n + 1 case. This Kahn Academy video contains a thorough and satisfying exposition of the proof. Printable Pdf of Feynman quote and tasks. 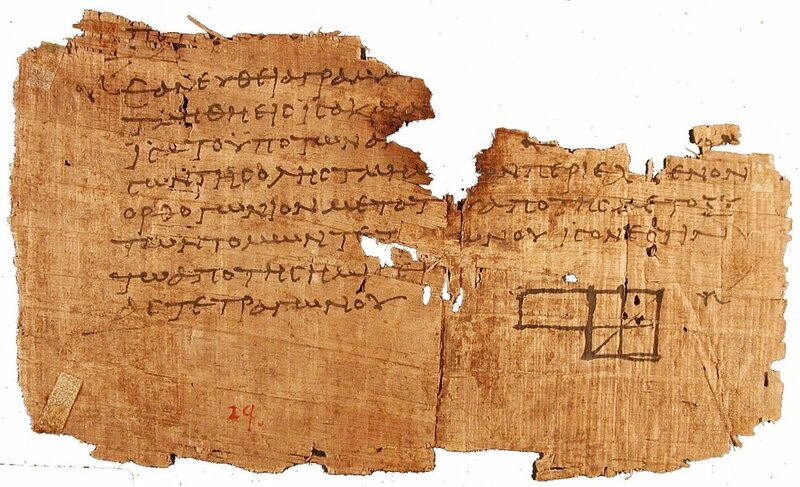 A fragment of Euclid's Elements: from the Oxyrhynchus Papyri, excavated from an ancient Egyptian rubbish dump!